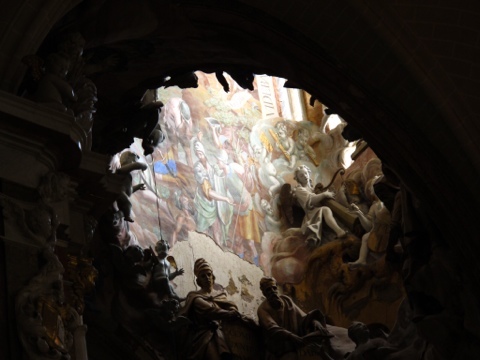 My TravelBlog piece dwells on my day trip to Toledo — my second time here in this lovely city brimming with art, culture and history. Ten years ago, I was also here and blogged about my experience in a brief stopover on our way south from Madrid. This time around, I would not be deprived the chance to visit and LINGER in the cathedral and in this place made even more famous in many El Greco paintings. 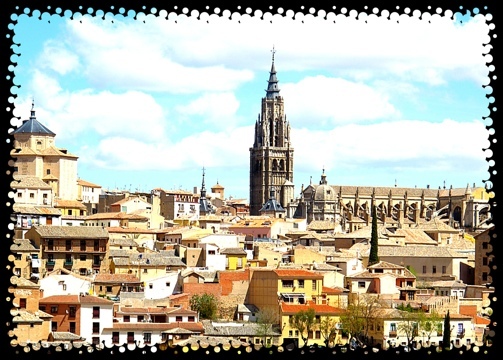 I choose to concentrate on the Toledo Cathedral. Having just recently visited the cathedrals in Avila, Segovia, Sevilla and Cordoba, you may think it’s overkill to visit another one. Not so in Toledo. 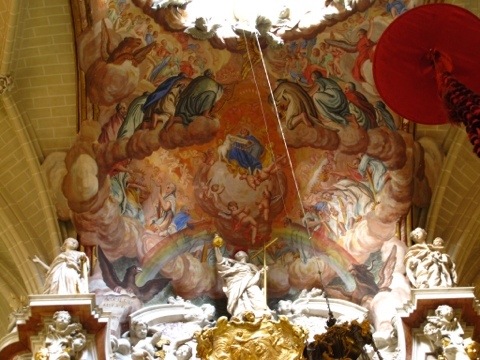 The retablo behind the Main Altar and that “hole in the ceiling” —- the dome — are enough to justify the €7 admission here. 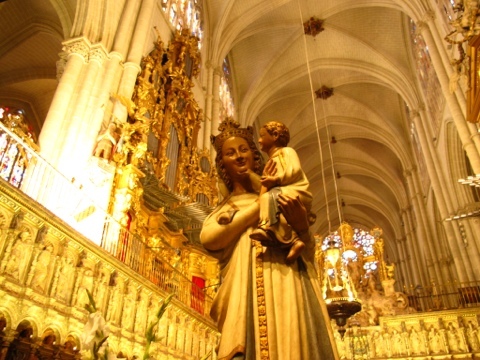 Not to forget, I particularly love the statue of a smiling Mama Mary and a playful Infant Jesus in the Choir area just right across the Altar. As I leisurely walked around the Cathedral, I would always catch myself looking up towards the ceiling. That “hole” impresses me so. I wonder how it was sculpted out up there, or how they even keep it clean, or how they change the lightings up there. Or is that natural lighting? Perhaps. As with many church areas where these geniuses of the past thought of almost everything! What an inheritance! 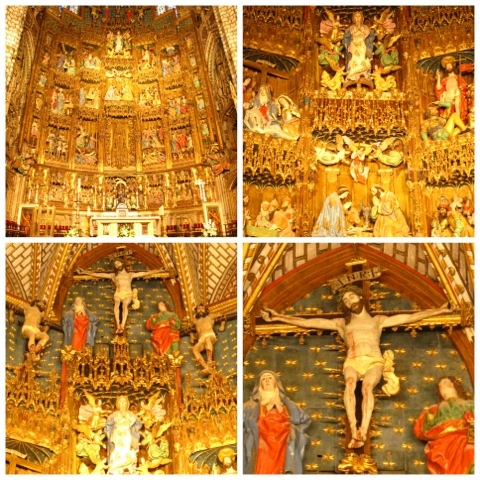 Spain is so lucky to have “inherited” all these treasures. 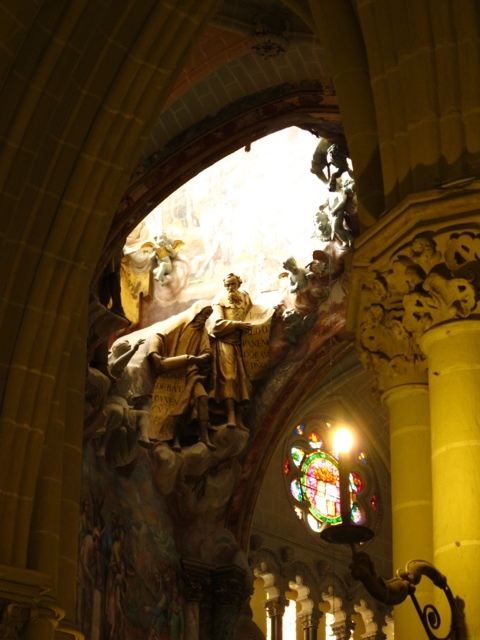 And all those El Greco paintings of saints inside the capillas. Of course no photography was allowed inside the chapels which may well be art galleries by themselves given the many precious paintings inside. And as one steps outside, there’s so much more to see. Truly, Toledo’s claim as the biggest “open-air museum” rings true. The best way to visit Toledo is to walk all around. Easily a half day just walking around, peeking in and out of churches and museos. Just imagine El Greco walking on the same cobble-stoned paths, drawing inspiration for his paintings and Miguel Cervantes for his Don Quixote novel from Toledo’s inheritance! 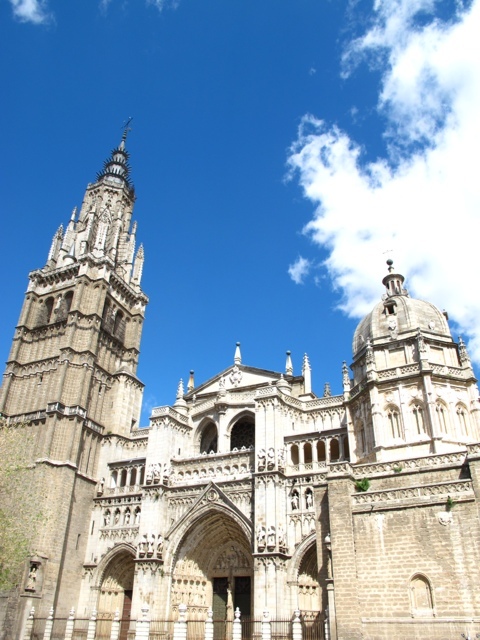 You may also want to read my 10 year-old blog on Toledo. It may be my 2nd time now, but the thrill of being in this huge open-air museum remains. 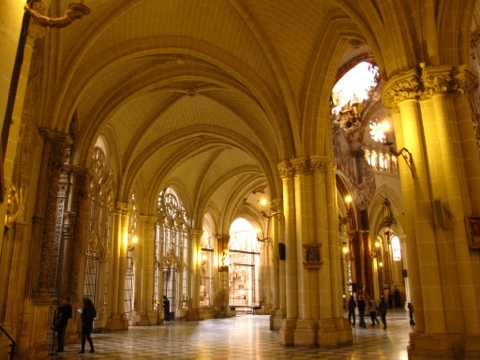 nice architetural design nd sculpture Images, and color glazed glasses inside the basilica. Breathakingly beautiful, LiliRam. Thank you for the “tour”.